If you own a TV, it’s hard to miss Geico ads. A billion dollars in annual spending will do that for you. We all know the Cockney-accented lizard and the indignant cavemen. 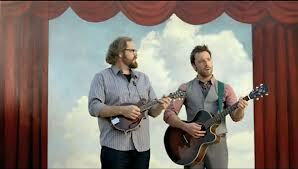 Both campaigns have evolved to be more about the characters than about anything Geico might do for you, the consumer. Some other Geico campaigns haven’t had the same staying power: Take the recent “taste-test” campaign, which wasn’t funny and made no sense. It left me wondering if Geico’s ad agency was on some kind of “meta” trip, in which they poke fun at the institution of advertising, you know, while they advertise heavily. Some people chuckle, which is a fine result if you’re a stand-up comic. I maintain that it’s crap advertising. It’s wholly undifferentiated. Except for the brief reference to “saving hundreds,” this is the rare campaign that could be applied to any other brand, not only in the category, but in the world. The claim is “Geico customers are happy.” There’s no support – for instance, are they happier than State Farm or Allstate customers? It just says “they’re happy.” Any brand could say that, and every bit as credibly. There’s no substance. Some Geico competitors are running counter-ads showing that some shoppers actually save money by switching away from Geico. Others, like Allstate’s “Mayhem” campaign, illustrate the downsides of cut-rate insurance. Meanwhile, Geico sticks to jokes and vague claims (“…sure are happy,” “15 minutes could save you 15%,” etc.). Two guys with guitars and nothing to say. “Quit your bitching, Matthew,” you might say. “Sales are up, so the Geico ads must be working!” And I’d first applaud you for actually checking the sales needle. Geico is the #1 provider of auto insurance through direct channels in the U.S., with revenue of $15.7 billion last year (up 7.5% over 2010, and an impressive 73% since 2004). I would then note that advertising is never the sole reason for growth. And that if you spent a billion dollars on advertising, you’d grow your business with almost any campaign you could conceive. Geico’s growth doesn’t mean its ads are perfect. We as brand-builders should ask better questions: Are the ads working as well as they should? With smarter ads, could Geico spend less and achieve more? Consistency. Geico has kept the same tagline for years, to the point that most of us could probably recite it. Focus. Geico has saturated its primary medium, television. Media Post News reports that, in 2011, one of every six advertising dollars in the insurance category was spent by Geico. Geico has chosen to own this medium and they’ve done well. It can be tempting for those of us with smaller ad budgets to learn the wrong lessons. We might think that advertising that entertains is the same thing as advertising that works. Call this “The Bud Light Fallacy.” Just because they do something doesn’t mean it works, and even if it works for them, that doesn’t mean it will work for you. Again, a big budget can hide a lot of mistakes. As I’ve stated in this blog many times, your job as a brand-builder is not to entertain. It is to motivate. And to maximize your business-building investments. Anything short of that has to be considered a failure. What are your thoughts on Geico’s advertising, and the use of humor at the expense of substance? Please add your thoughts in a comment below. Need help defining what makes your brand (and thus your advertising) different? Three Deuce Branding can help.